An army of geneticists scouted for disease genes in the DNA of people with amyotrophic lateral sclerosis. They found a TANK. TANK-binding kinase 1, to be precise, or TBK1 to its allies. The gene, which mobilizes in autophagy and neuroinflammation, cropped up in one of the largest exome-sequencing projects yet, noted Tim Harris of Biogen Idec in Cambridge, Massachusetts. Harris is the senior author of a paper describing the finding in the February 19 Science Express. He and collaborators scoured the protein-coding DNA of 2,874 ALS and 6,405 control genomes. While Harris estimates the new gene underlies fewer than 2 percent of ALS cases, he said it still offers reason to pursue therapeutic targets in autophagy and neuroinflammation. “It is an impressive genetics study and quite convincing,” commented Randal Tibbetts of the University of Wisconsin in Madison, who was not involved in the work. ALS genes have been coming fast and furious lately. TBK1 is the sixth potential risk gene to be identified in the past two years, following on the heels of TUBA4A, CHCHD10, matrin 3, TREM2, and ErbB4. Harris and co-senior authors Richard Myers of the HudsonAlpha Institute for Biotechnology in Huntsville, Alabama, and David Goldstein of Columbia University in New York collected those thousands of DNA samples from collaborators across the globe. A positive control, the known ALS gene SOD1, was significantly associated with the disease in their data set. Joint first authors Elizabeth Cirulli of the Duke University School of Medicine in Durham, North Carolina, and Brittany Lasseigne of the HudsonAlpha Institute discovered a few dozen variants in the TBK1 gene, occurring all across the sequence and in both ALS cases and controls (see image above). TBK1 sequences differed in nearly 1.5 percent of ALS genomes, compared to 0.2 percent of the control samples, and the gene easily passed statistical tests indicating some of those variants are associated with the disease, Harris said. Because the variants are rare, it required a study of this size to find the ALS link, he added. TBK1 contains an amino-terminal kinase domain, a ubiquitin-like domain in the middle, and a leucine zipper at the carboxyl terminus. With the variants sprinkled throughout the coding region of the gene, the genetic data offer no easy hint as to what the problem might be in people carrying those mutations. Goldstein said he and others are already experimenting with the mutant proteins to determine which domains might be affected in ALS. TBK1’s functions offer some clues as to how the protein might function in motor neurons. In fact, it participates in two processes already known to be altered in ALS. A recurrent theme in this and other neurodegenerative diseases has been defects in the disposal of worn-out or aggregated proteins (see Jul 2010 news; Jul 2014 news). TBK1 promotes autophagy by phosphorylating two other proteins linked to ALS, optineurin and sequestosome 1 (also known as p62) (Morton et al., 2008; Pilli et al., 2012; and Related Papers). Researchers have found TBK1 and optineurin co-localizing together with protein aggregates in HeLa human cervical cancer cultures (Korac et al., 2013). 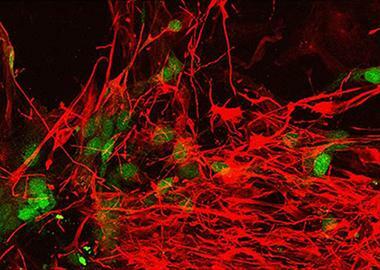 ALS researchers have also been pursuing the role of immune cells in the disease; sometimes they protect neurons and other times they attack them (see Oct 2008 news; Sep 2009 news; May 2011 Webinar). TBK1 plays a complex role in immunity. It inhibits kinases that activate the NF-κB complex, thus checking production of pro-inflammatory cytokines such as interferon-β. However, it also activates the transcription factor IRF-3, which promotes interferon transcription (see image below; Clark et al., 2011; Fitzgerald et al., 2003; Liu et al., 2015; and Related Papers). Optineurin and sequestosome 1 also inhibit NF-κB-based inflammation (Zhu et al., 2007; Zhang et al., 2014). “TBK1 may play an important role in neuroinflammatory response,” commented Hideshi Kawakami of Hiroshima University in Japan, who discovered that optineurin was an ALS gene (see May 2010 news). Kawakami played no role in the current work. While TBK1 was the only definite find in the screen, the authors detected a handful of other genes that looked more tentatively like they might be associated with ALS. Of these, the highest scorer on statistical tests was NIMA-related kinase 1 (NEK1), which sat right near the line for significance. NEK1 participates in cell-cycle regulation, a process not previously linked to ALS. Indeed, most neurons are post-mitotic, meaning they have long halted their cell division processes. “NEK1 mystifies me,” said Goldstein. On one hand, some in vitro research supports a role for this gene in ALS. Study collaborator Wade Harper of the Dana-Farber/Harvard Cancer Center in Boston found that NEK1 co-immunoprecipitated from human kidney cells with two ALS-linked proteins, Alsin and VAPB. On the other hand, NEK1 variants are common among the general population. If those variants do confer risk for ALS, they must do so in only some carriers, said Goldstein. That Harris and colleagues analyzed nearly 3,000 exomes and found only rare ALS mutations suggests that there are no more common variants to find, at least no simple ones, commented Stuart Pickering-Brown of the University of Manchester in the United Kingdom, who was not involved with the work. Pickering-Brown pointed out that this kind of study would not detect expansions, such as the hexanucleotide repeats in the C9ORF72 gene (see full comment below). Harris plans to continue sequencing more samples, probably entire genomes, he told Alzforum. Goldstein said he is working on a TBK1 mutant mouse, and others are developing a stem cell line from a person with one of the mutations (see image above left). The TBK1 finding raises lots of questions for ALS researchers to tackle, commented Tibbetts. How do mutations affect its kinase function? Does TBK1 turn up in aggregates in the spinal cord of people with the disease? How about TBK1 mutations in other neurodegenerative diseases, such as frontotemporal dementia? “It is a lot of food for thought,” Tibbetts said. Cirulli ET, Lasseigne BN, Petrovski S, Sapp PC, Dion PA, Leblond CS, Couthouis J, Lu YF, Wang Q, Krueger BJ, Ren Z, Keebler J, Han Y, Levy SE, Boone BE, Wimbish JR, Waite LL, Jones AL, Carulli JP, Day-Williams AG, Staropoli JF, Xin WW, Chesi A, Raphael AR, McKenna-Yasek D, Cady J, Vianney de Jong JM, Kenna KP, Smith BN, Topp S, Miller J, Gkazi A, FALS Sequencing Consortium, Al-Chalabi A, van den Berg LH, Veldink J, Silani V, Ticozzi N, Shaw CE, Baloh RH, Appel S, Simpson E, Lagier-Tourenne C, Pulst SM, Gibson S, Trojanowski JQ, Elman L, McCluskey L, Grossman M, Shneider NA, Chung WK, Ravits JM, Glass JD, Sims KB, Van Deerlin VM, Maniatis T, Hayes SD, Ordureau A, Swarup S, Landers J, Baas F, Allen AS, Bedlack RS, Harper JW, Gitler AD, Rouleau GA, Brown R, Harms MB, Cooper GM, Harris T, Myers RM, Goldstein DB. Exome sequencing in amyotrophic lateral sclerosis identifies risk genes and pathways. Science. 2015 Feb 19; Pubmed.